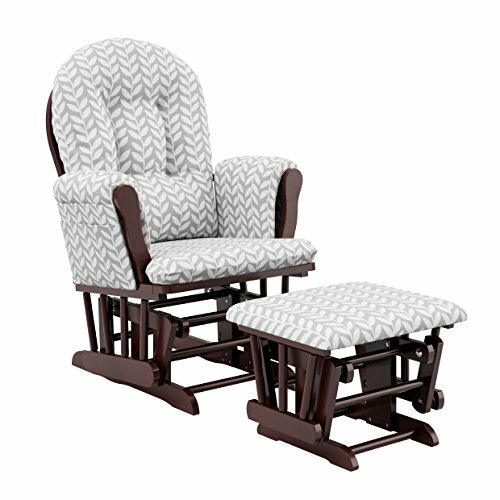 With its bold pattern and modern color options, the Storkcraft Vine Hoop Glider and Ottoman set will be a statement in your nursery. Combining all the features you love about the Classic Hoop Glider and Ottoman, the Storkcraft Vine provides a comfortable place for feeding time, while allowing you to create special moments with your little one. Featuring padded arm rests and large side pockets for convenient storage, these soft polyester cushions can be easily spot-cleaned when challenged with accidental leaks and spills. The Storkcraft Vine Hoop Glider and Ottoman is constructed with sustainable rubber wood (hardwood) and composites with enclosed metal ball bearings for the smoothest gliding motion. Customize your baby's nursery with the Storkcraft Vine's range of color and finish options.